Drivers of cars, trucks, and other vehicles do have a duty to look out for pedestrians. If a car or truck strikes a pedestrian, the pedestrian is likely to die or suffer catastrophic injuries. That pedestrians rely on drivers to drive safely doesn’t mean drivers are automatically liable for pedestrian accidents. Some times, a driver is not liable because the pedestrian acted carelessly or recklessly. It may even be possible to hold a pedestrian accountable for a car or truck crash. The pedestrian jaywalks. If a person walks in the middle of the street instead of at the nearest intersection, he or she may be responsible for the accident. The pedestrian is drunk or under the influence of narcotics. Drunk pedestrians may not have control of their actions. They may often cross when they shouldn’t. Even if they have the right of way, it can be hard for a driver to anticipate their walking path. A pedestrian walks across an intersection or path while distracted. Many walkers, these days, don’t even realize they’re crossing against the light because they’re focused on their cell phones or looking up at a something else. The pedestrian is an area where he/she shouldn’t be. Some intersections have signs that prohibit walking because the intersection is known to be dangerous. Some bridges and highways forbid walkers from being on them. Arizona does permit the assignment of partial fault to a claimant. If two drivers are involved in an accident and the injured claimant is 25% at fault, then the injury victim’s damage award will be reduced by 25%. The same rule applies to pedestrian accidents. A claim by a pedestrian against a car or truck driver may be reduced if the pedestrian was partially at fault. In theory, injured riders could file a claim a pedestrian who acts negligently. Pedestrians are not immune from lawsuits. For example, an adult who runs into the middle of the street causing cars to crash into each other while they attempt to avoid the pedestrian could be held liable. 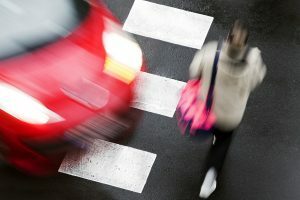 If the pedestrian did not have liability insurance, because he/she didn’t own a car, then the injury victim could file a claim with his or her own UM/UIM carrier.